If you are familiar with vanilla from the Bourbon varietal (which makes up the majority of the world’s vanilla bean supply,) the Tahitian bean will look almost alien. Tahitian beans are over twice as large as their Bourbon counterparts. Tahitian beans are plump with moist pulpy interior that is deep amber in color. In yield testing, the Tahitian varietal contained 11% more seeds and pulp than our Madagascar Bourbon vanilla beans. 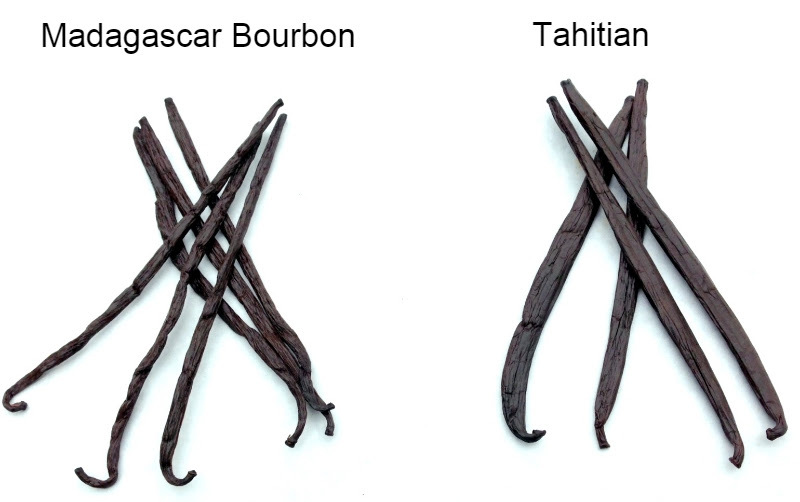 However, Tahitian vanilla beans are hardly a frugal alternative to the more commonplace Madagascar Bourbon. The difference in price is due largely to the rarity of the Tahitian Beans. Tahiti is a small island, with an even smaller vanilla production, and a more industrialized economy that demands a higher labor cost. In fact, it is best to view them as different ingredients with different uses. Madagascar Bourbon has the classic “vanilla” aroma: woodsy, lightly floral, and sweet. Madagascar Bourbon vanilla is best used in dishes where the vanilla is meant to compliment other flavors. It is exactly the vanilla that you want in order to bring out the best in a chocolate chip cookie. While Tahitian vanilla contains less of the vanillin chemical compound, the flavor is more delicate and nuanced, with with tropical floral overtones and hints of cherry, licorice, and cinnamon. Tahitian vanilla is best used in a dish where its delicate flavors will be the highlight of the dish; such as ice cream or panna cotta.